16 | July | 2009 | Through the seasons before us.. Number one is Brian Rice, oh, sorry, I mean Lee Camp! Squad numbers, perhaps it’s the proliferation of numerological conspiracy theory type books like those by Dan Brown, Kate Mosse or Titania Hardie, but we all love to try to divine hidden meanings in numbers. At least, I know myself and Rish do! I decided to hang fire ’til the actual list was released – and it turns out they pretty much match the observations others made regarding the training kit numbers players were wearing! Certainly the first point of interest is that Paul Smith has – as expected – lost his number one shirt to Lee Camp. That’s a pretty clear indication of how the land lies in the goalkeeping department, and something that I would hope has really pissed off and fired up last season’s first choice. We need competition in there, after all. Perch switches from 7 to 2, with Kelvin taking Breckin’s 6, and Anderson taking Perch’s 7. Does that mean Perch is going to be made a right back? Who knows! Number three is vacant which hopefully foretells the signing of a left back, whilst Chambers retains number four. Dele gets the nine shirt, with Tys shunted to 11, with Earnie retaining 10. And that’s our 1-11. Cohen is still 15, Garner vacates 16 (presumably for McKenna) in favour of 14. McGoldrick takes 17, Moussi 19, Smith 21, Arron Davies relegated to 20. Thornhill 28, and Bennett 29. So that’s a squad of 19. That’s not very many really, is it? 20 assuming the McKenna talks end in our favour with the midfielder signing. Whether the huge gap between Smith and Thornhill show intention to grow the squad, or just not wanting Benno to feel lonely on the list, who knows? What is very clear though, is that with the souvenir shop about to reopen following refurbishments, is that almost certainly we’re due the big reveal of one of the two new kits being released this year – probably the away one, which means we can all scamper off to the City Ground and buy it emblazoned with the name and number of our favourite player with no fears of it being inaccurate! I imagine Luke Chambers is kicking himself, all that talk of the captain’s armband and it looks like our long courtship of Paul McKenna will probably put paid to that! Forest and Preston have finally agreed a £750k fee for the midfielder, who is now able to discuss personal terms with the Reds – who I imagine will be aware of what will be needed to convince him to move. McKenna will provide that much needed level head and experience in midfield that we’ve lacked for, well, a long time. Neil Lennon was supposed to provide it a couple of seasons back, but the fact that his legs were gone and his mind was on its way to follow them put paid to that. He is firmly in the top ten of Preston’s all time appearances, and is their current longest serving player and captain, had he stayed (or rather, should he stay) there for 2009/2010 he could well have found himself their all time leading appearance maker. That Forest have left his preferred squad number vacant (more on squad numbers later today when I get the time) indicates to me they are confident of landing their man. As a player he’s known for committed performances and intelligent passing – something we’ve lacked in the centre of the park for a while. He also pops up occasionally with a screamer of a goal or two. Hopefully terms will be agreed and he’ll sign a deal – because I think he’d be a great addition to the squad. Nottingham’s 2018 world cup bid is back in the papers today – complete with pictures of the proposed new stadium which is rather central to the bid. 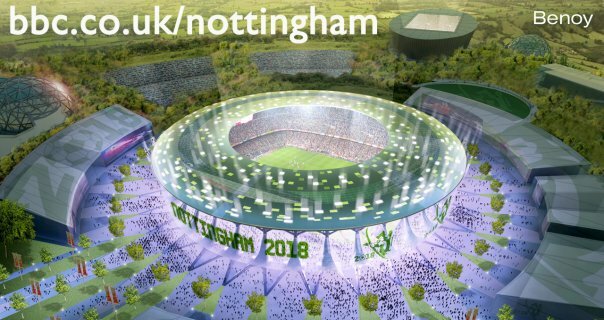 Contrary to past reports that it would be ‘unique’ and would definitely be distinctively Forest’s ground – I’m not convinced by the latest artists impression which looks like a fairly featureless bowl design as available in countless other conurbations. Whilst I can see the big picture benefits for Nottingham as a place, I can’t help but think that Forest are somewhat shoehorned into this scenario. If we are being honest, we have no need for a 50,000 seater stadium. And if I’m being brutally honest, I don’t think we will have need of that in the medium term either – and that’s even if we were to attain top flight status. However, it’s a nine year projection – a nigh on impossible time period to forecast over – nine years ago Bradford narrowly avoided relegation from the Premier League, whilst Hull City managed to complete a mediocre season finishing 14th in League Two. A great deal can change in that kind of timescale, so perhaps my natural cynicism and caution should be put aside, and the ambition of the powers that be applauded. But my emotional attachment to the City Ground, site of so many triumphs (and disasters! ), beautifully nestled on the banks of the River Trent, forbid me from wanting to leave. Certainly forthcoming designs will require a little more obvious Forest-related branding – when they said the new stadium should be green I didn’t think they meant the colour of the roof! When they said it wouldn’t just be another flatpack bowl design like Derby, Leicester, Southampton, Middlesbrough, Stoke and countless others – well, I’m not convinced by that design either. Sorry 2018 bid, I’m not dismissing you summarily but you need to convince me more than you have done before I’ll back it.